Start here for our most frequently asked questions on the most affordable, FUN, all-inclusive girlfriend weekend getaway! Go to the Registration page. From there you can select your event and sign up. You can pay with a credit card through PayPal or you can mail in a check. Please make checks out to “Joy Envoy”. Do you know a fabulous, hard-working, busy woman who could use a little more fun, positivity and play in her life? Of course you do! Grownup Girlz Camp is perfect for women 21 – 101 who are looking to spend a fun, carefree and joyful couple of days. What if I don’t know anyone else who’s going? No problem! One of the great things about joining us is that you will meet several new friends! 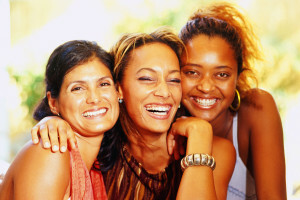 We provide a safe, fun environment for women to meet and form friendships. We also offer 2 “Early Bird” discounts, so the earlier you register, the more you save! Save $100 when you register at least 6 weeks prior to the event or save $50 when you register at least 4 weeks prior to the event. • Dinner on Saturday and Sunday Brunch buffet and Lunch on Sunday. • Lots of fun surprises! Visit our “Pricing” Page for more details! Is the price really all-inclusive? Absolutely! When we say “leave your wallet at home” we mean it! All you need to do is show up, ready for fun and friendship! Everything is taken care of for you, the meals, the activities, the room is all paid for and pre-arranged. We even pre-pay the Bellman and Maid gratuities! What types of activities will there be? • Learning fun dances like Belly dancing, hula, Michael Jackson’s Thriller. You seem to have a very full schedule with a lot of different activities. What if I don’t particularly have an interest on one, can I opt out? Absolutely! This weekend is all about you. If there is something that isn’t your cup of tea, don’t sweat it, take a break by the pool and relax. We offer a wide variety of activities to give our girlfriends the opportunity to try new things they may not have had the time for before. But if something isn’t going to tickle your fancy, your time is yours to spend how you wish. * PJ’s and a robe – We invite gals to come to “Chick Flick Movie Night” in your PJs if you want (not required of course) but a whole lot of fun. We get cozy for the movie with blankets, pillows and of course popcorn! * Flat shoes such as sneakers (or you can just kick them off!) for our physical activities like dancing or self-defense demos. * Cancellations made 31 days or more prior to the event receive a full refund minus a $25 processing fee. * Cancellations made 15 – 30 days prior to the event receive a 50% refund. * Cancellations made 14 days or less prior to the even are not refundable. Register now for your all-inclusive girlfriend getaway!